Italvacuum, an international manufacturer of vacuum dryers and vacuum pumps for chemical, pharmaceutical and cosmetics industries, has recently introduced on the market an innovative horizontal paddle dryer. It is Planex® System, a multi-patented machine which is conquering the most demanding operators, by guaranteeing results that were unthinkable till now with conventional systems, both horizontal and vertical. Designed to dry wet feed from filtration and centrifuging processes Planex® System is ideal for the production of APIs, fine chemicals and intermediates. The major added-value of Planex® System is the eccentric agitator with two independent movements that can simultaneously revolve around its own axis and rotate tangentially to the drying chamber. The combined rotations of the agitator and its small size compared to the drying chamber diameter, ensures the perfect mixing of the entire batch, and allows consuming at least three times less energy than conventional dryers with a concentric agitators. This means a threefold reduction in mechanical and thermal stresses on the batch being dried. As a result, even temperature-sensitive products are treated with maximum care. But there is more. The Planex® System control software allows to automatically command the agitator movements with the Stop & Swing program. In this way, the agitator swings back and forth, thus remaining all the time immersed in the product, and guaranteeing its continuous mixing. This approach is particularly effective when processing small batches. Moreover Planex® System, thanks to its agitator’s ZeroFriction® planetary movement, prevents the product from being rubbed against the drying chamber walls and thus heating up due to friction, a typical problem in conventional paddle systems. In addition, the rotation of the paddles tangentially to the chamber walls, conveys the product into the small clearance between the agitator and the chamber surface, preventing lumps formation and guaranteeing an even more effective drying and a controlled final particle size distribution, which is impossible to achieve with conventional dryers. The minimum clearance between agitator profile and chamber walls not only prevents product buildups, but it also makes discharge significantly easier. In addition, there is a specific automatic program for the discharge operations. These operations are even more effective thanks to the agitator "pendulum" movement, which swings by 90 degrees in the discharge area. As a result, the amount of product left in the chamber after discharge is truly minimal, averaging less than 1% of the volume. Planex® System features outstanding loading flexibility. The system is available with total volumes ranging from 150l to 3,200l. Maximum loading capacity depends on the product to be processed, and can vary from 15% to 80% of the chamber volume. The system can meet all the production needs of the pharmaceutical and chemical industries, as it is capable of processing small amounts of product as well as large batches. Planex® System is safe for operators, the environment and the product, because it is designed and manufactured in compliance with European Union ATEX Directives and CE marking requirements, as well as with the increasingly stringent US FDA standards and cGMP regulations. All the parts that come into contact with the product are made of AISI 316L stainless steel, but other weldable materials such as Alloy C-22 and AISI 904L are available on request. 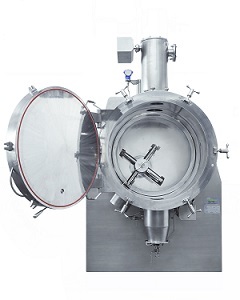 The drying chamber walls, the agitator shaft and the access hatch are heated by diathermal fluid circulation to prevent cold spots that could cause solvent condensation or product buildup. Internal surfaces of the drying chamber are lapped or electropolished to optimize corrosion resistance, reduce adhesion and friction on the product, improve powder flow behavior and facilitate cleaning operations. The shaft of the agitator is complete with a double mechanical seal system, studied to guarantee the perfect vacuum tightness and the absolute purity of the dried batch, avoiding any risk of contamination of the product. The mechanical seal may be of conventional type with wet flushing or run dry with nitrogen immission. All the operations involved in washing the interior of the dryer, removing the internal parts, inspecting the unit and cleaning the exterior are simple and straightforward. The fully accessible chamber interior, with no hard-to-reach zones, ensures that the entire dryer can be perfectly cleaned. To make the washing operation even more effective, the dryer is equipped with an efficient C.I.P. system with retractable rotating washing head. This not only guarantees perfect cleaning, it also provides significant savings: the agitator’s off-centered position enables it to rotate during washing, thus reducing the amount of liquid needed. Thanks to its special structure, the agitator can be readily disassembled into removable sectors, thus making cleaning operations even more effective. This is an exclusive feature that makes Planex® System a one-of-a-kind dryer: in conventional systems, the agitator is made of a single structure and removing it requires the use of bulky equipment and long system downtimes. The big front-opening hatch provides full access to the entire drying chamber. Other advantages include the agitator’s off-centered position. This allows the operator to have more room to work, making it even faster and easier to carry out swab testing. The exterior of Planex® System is also easy to clean. The entire machine is housed in a sealed external casing (cGMP particle-free configuration) which encloses the insulation and all electrical, hydraulic and pneumatic circuits. In addition, no support to the machine is present in the clean room, as the drying chamber is flange-mounted on the wall. In this way the chamber exterior can be cleaned quickly and effectively, avoiding product accumulations in slots or junctions. These features, combined with the partitioning approach, permit clean room installation, so that the clean area can be pressurized and kept separate from the technical area. In its factory, Italvacuum has a Planex® System pilot, which allows to carry drying tests.